Fernando Alonso has admitted that he finds it difficult to understand why he was given a five-second penalty during the Japanese Grand Prix. He was not the only driver to receive the same sanction with Max Verstappen also harbouring the same feelings towards the stewards. Lance Stroll was also penalised by five seconds for his part in the last chicane incident with Alonso. 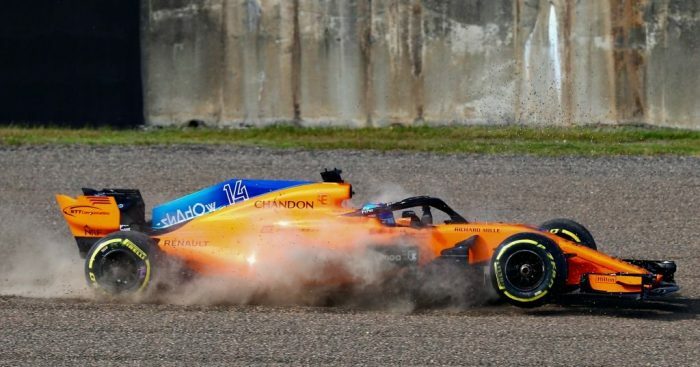 “Unfortunately, the five-second penalty I received in the first part of the race dropped me down several positions,” Alonso said. “It wasn’t a big drama, because we were out of the points anyway, but it’s difficult to understand the stewards’ decision. The McLaren man was given the time penalty for “leaving the track and gaining an advantage”. Despite the penalty, and only managing a P14 finish, the two-time World Champion enjoyed his afternoon around the Suzuka circuit. “In spite of the poor result, I did enjoy driving around this track today,” he added. “The first lap was quite good and intense, and in the Esses especially we were overtaking each other inside and outside and we recovered a few places. “In the last couple of laps there was also a good battle with the Williams and [Marcus] Ericsson who were struggling on old tyres, so we had to fight a little bit. Alonso still remains third in the ‘B’ Championship, three points behind both Nico Hulkenberg and Kevin Magnussen.